This poor chair finally got some love! I got it off Craigslist for $15 in the fall from a young girl who had originally gotten it from a consignment shop in South Carolina. 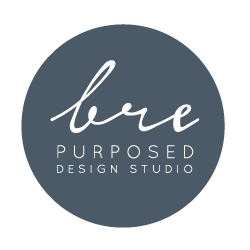 I love hearing about where pieces came from and learning about their history. It sat on our front porch until about a week ago. It weathered the sun, leaves, rain, snow; you name it. I think it was a mixture of being intimidated by it and having no idea what I wanted to do with it. 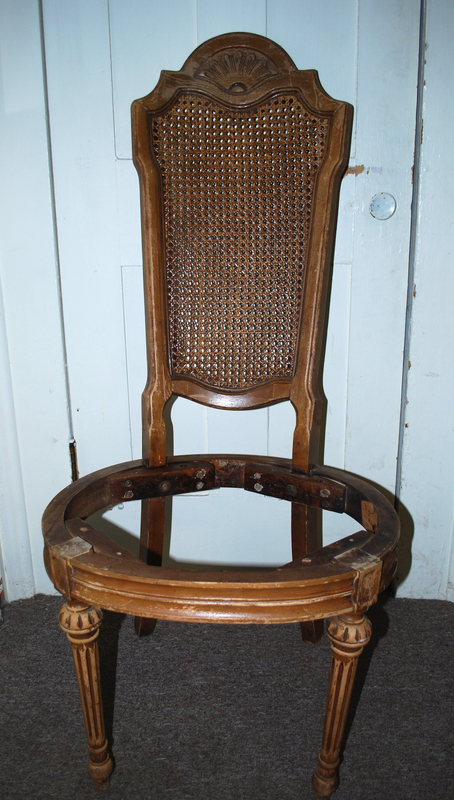 Look at this gorgeous chair now! What we were starting with was far from pretty. But the shape of this chair? I mean come on, look at those legs! And I love how big the seat is. I’m so glad I was able to scoop it up and give it new life. I decided my color palette for this was going to be white and gold. I honestly stood in the spray paint aisle for 15 minutes trying to decide what shade to pick. I wish the caps were truer to what color actually came out of the can, because that would make things A LOT easier. I finally decided to go with a more subtle metallic. 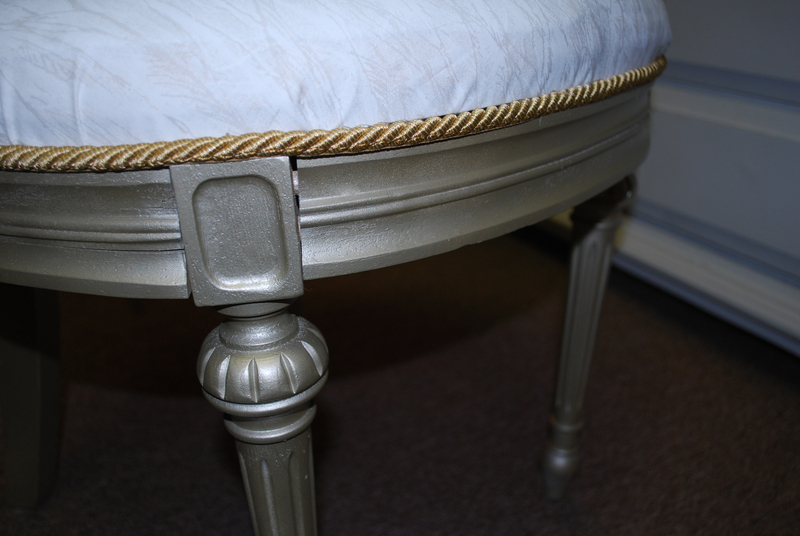 The name is Champagne Nouveau with a satin finish. 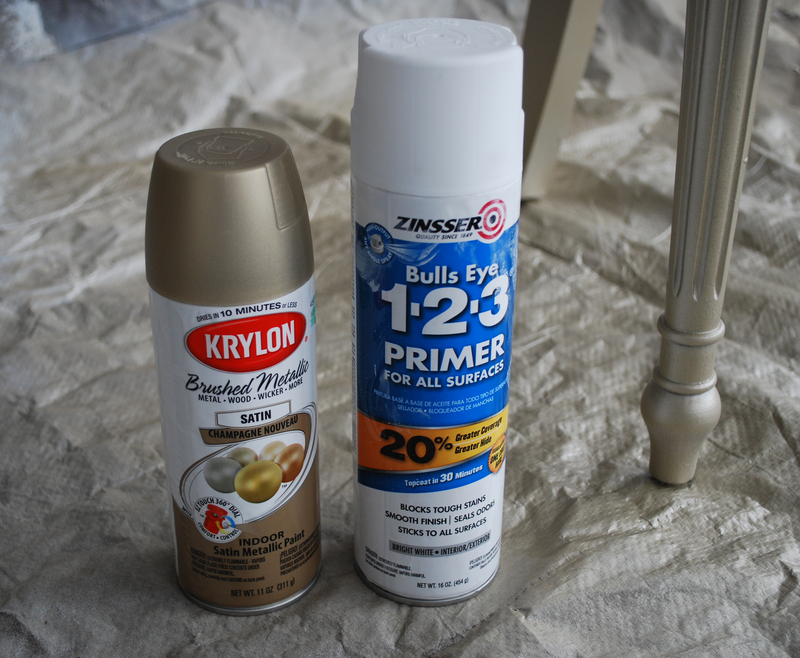 I primed first with Zinsser’s 1-2-3 Bulls Eye Primer. This stuff covers great and I only needed one coat. 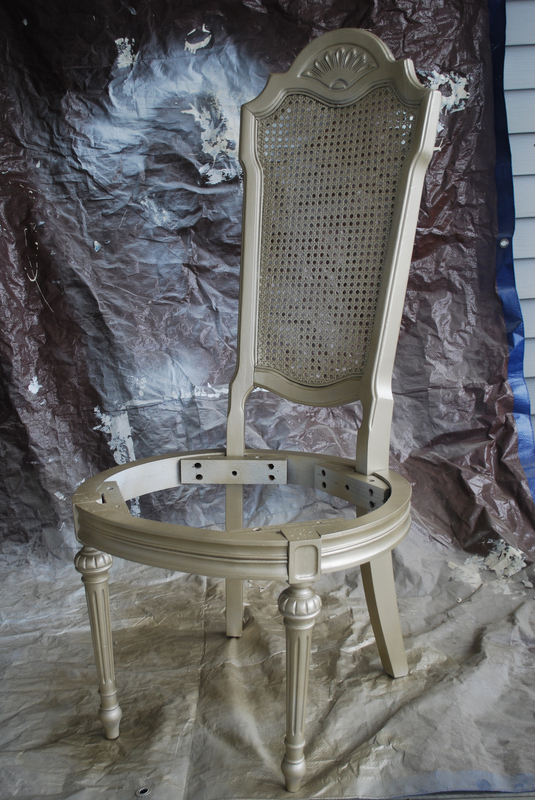 I used a can and a half of the gold (about 3 coats). Sidenote: The primer said to use in 70 degrees. That clearly wasn’t happening and I didn’t have any problems with it at 45 degree. I love this color and will definitely be using it again. It’s great if you want more of a subtle gold and not that bright metallic look. Now onto the cushion. I knew I wanted to use white fabric, but I wanted something with a little texture to it. I found the perfect thing at Hobby Lobby. It almost has a crackle look to it, only seen in certain light and angles. 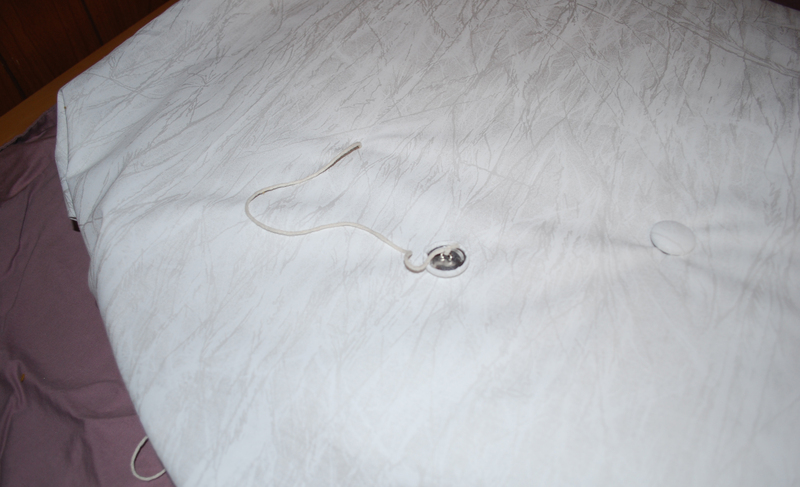 Since the previous fabric had two lines of piping sewn in, it was hard to use it as a pattern. I kept the same foam as it was still in good condition. Laying that out on top of my new fabric I cut a rough circle with about 3 inches to spare around the edges. 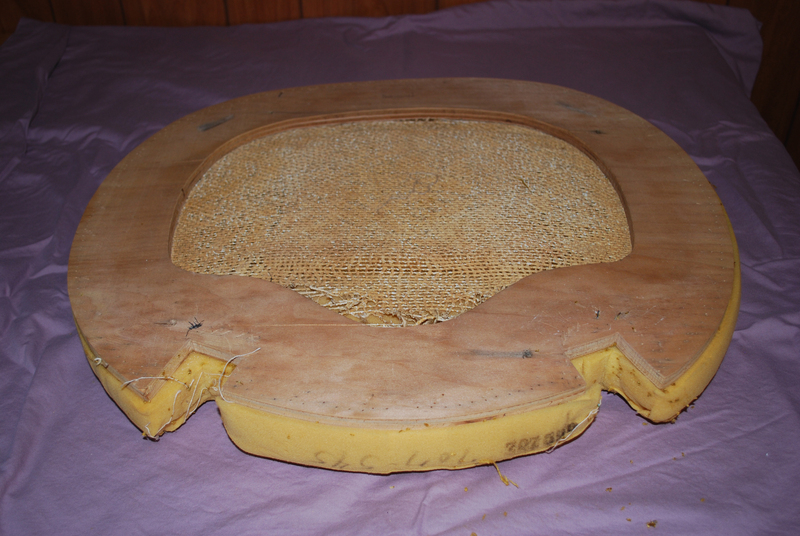 As you can see, the wooden base has a hole in the middle. This made my night and eliminated a step I thought I was going to have to do. 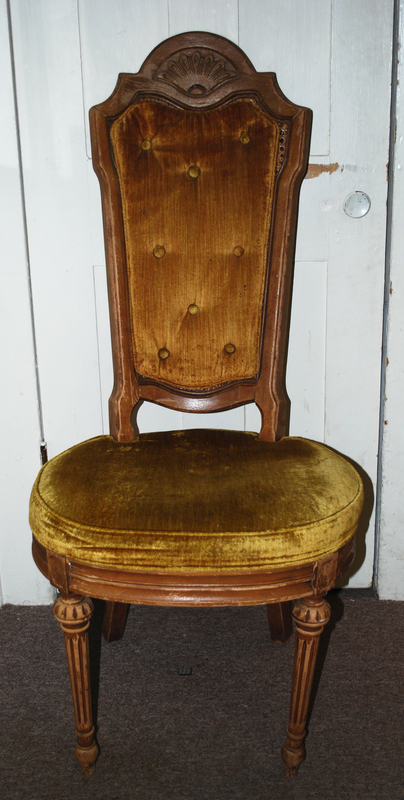 I knew I wanted to add tufted buttons and this meant I didn’t have to drill through the wood. Woo! 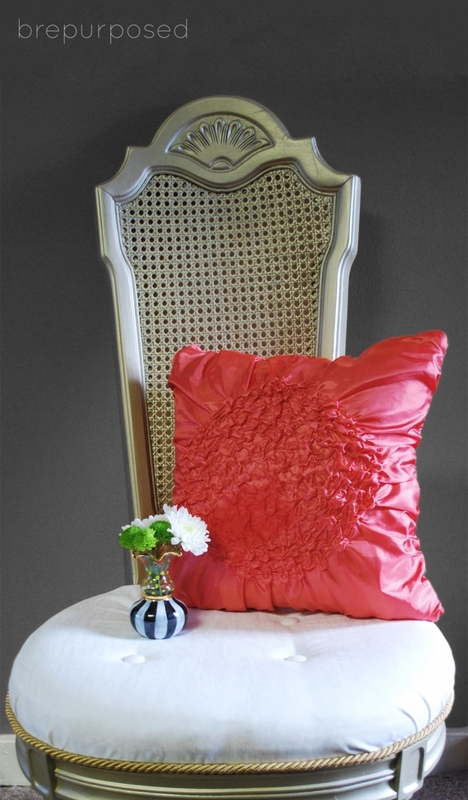 I used the same button kit and method of tufting that I used on my Piano Bench Ottoman here. 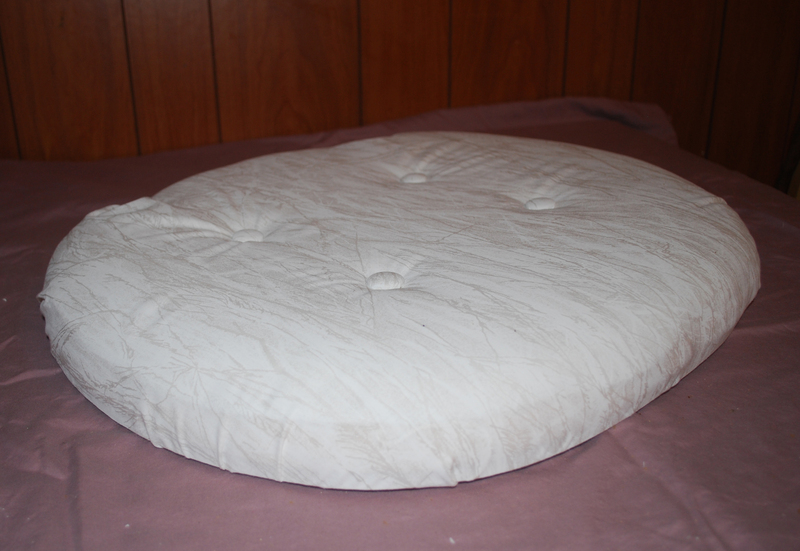 After I got the buttons on, I stapled my fabric and batting underneath and reattached the cushion to the frame. The original piping got me to thinking if that was something I wanted to keep. I got my supplies to try a no-sew piping method but stumbled upon this gorgeous rope in the clearance section at Hobby Lobby. For $1.34 I had to get it. I wasn’t sure if it would match the gold of the chair but I couldn’t pass it up for that price. 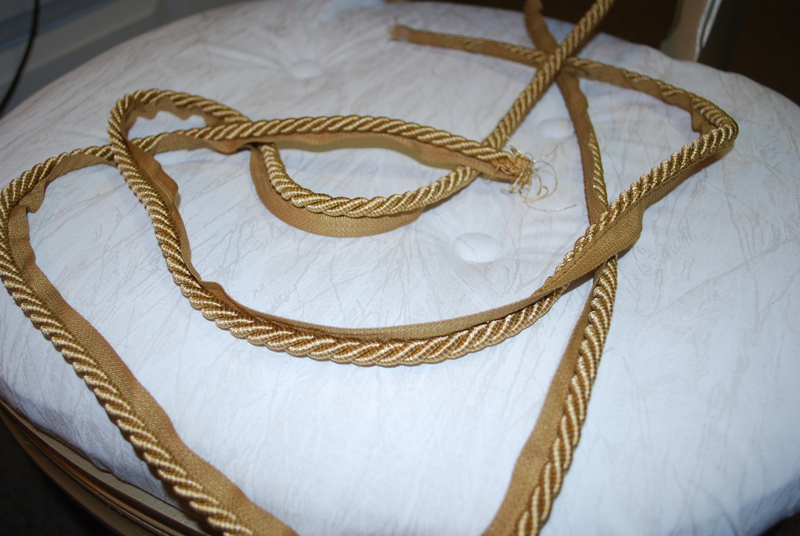 I tied the rope around the chair to get a feel for how it would look, and continued to stare at it for a while. I also texted a couple friends to ask their opinion (you know who you are!) Group decision: do it! 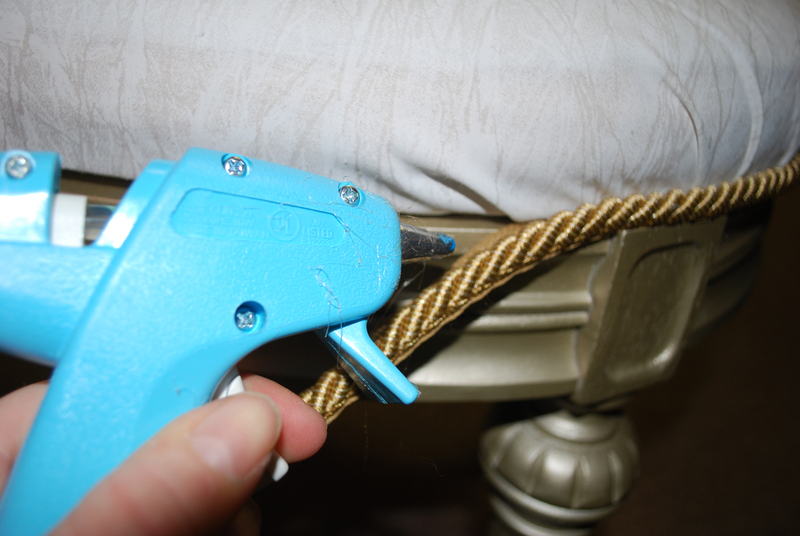 I used a hot glue gun to attach this between where the cushion and frame meet. Gluing along the lip and sliding that in between the two. After tightening all the screws back in underneath, this baby was just about done. 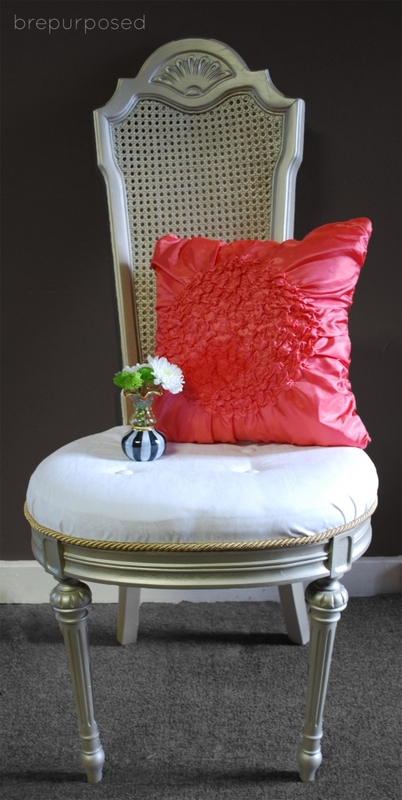 I had planned on finding a navy blue and white throw pillow to use as an accent, but found that this coral pillow we had from our guest bedroom set just went so well with the gold and white. I love the bright pop of color it gives it!